The RadFilter Smart Tag provides convenient access to the most common settings for the control. You can display the Smart Tag by right clicking on the RadFilter in the design window, and choosing the "Show Smart Tag" option from its context menu. 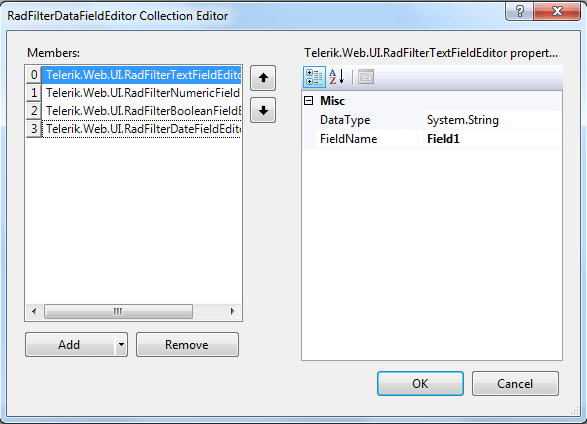 The data field editors collection allows you to customize the way filtering is performed. You can use one or more data field objects in a single RadFilter control, which will help the site visitor to filter the data visualized by its container control. The Add RadStyleSheetManager link adds a RadStyleSheetManager to your Web page. 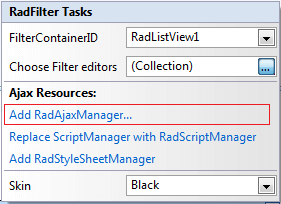 The Add RadAjaxManager link adds a RadAjaxManager to your Web page. 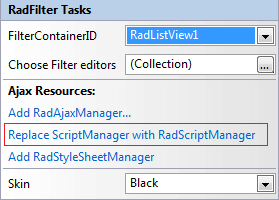 The Replace ScriptManager with RadScriptManager link replaces the Microsoft Ajax Extensions ScriptManager with RadScriptManager. 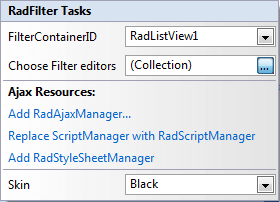 The Skin drop-down displays a list of available predefined skins that you can apply to RadFilter control. Assign a skin by selecting the one you want from the list.